By Michael Rose, D.O., Wesley Clarkson, D.O. 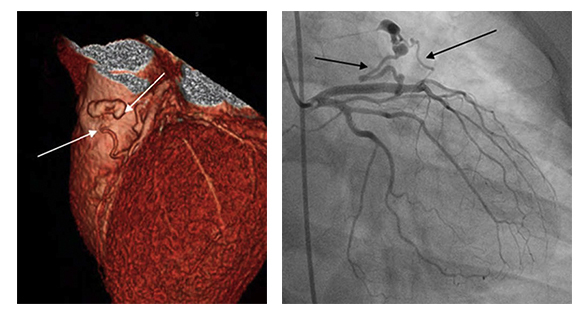 Cardiac CT and coronary angiography of a 61-year-old woman demonstrates two coronary-pulmonary artery fistulae (arrows). Further evaluation revealed that her fistulae were not hemodynamically significant, as evidenced by no increase in oxygen saturation on her right heart catheterization, normal left ventricular function by echocardiography, normal fractional flow reserve measurement of the left anterior descending coronary artery, and no clinical or electrical evidence of ischemia on surface EKG during exercise. Coronary artery fistulae involve a communication between a coronary artery and a chamber of the heart (coronary-cameral fistula) or a segment of the pulmonary or systemic circulation (coronary arteriovenous fistula). Most are small, asymptomatic, and found incidentally. Large fistulae, however, can cause symptoms, hemodynamic compromise, coronary steal, and high-output congestive heart failure. Transcatheter closure involves either coiling the fistula or deploying an umbrella device. A small to moderate-sized fistula in the presence of documented myocardial ischemia, arrhythmia, otherwise unexplained ventricular systolic or diastolic dysfunction or enlargement, or endarteritis should be closed via either a transcatheter or surgical approach after delineation of its course and the potential for obliteration of the fistula. Clinical follow-up with echocardiography every 3 to 5 years may be useful for patients with small, asymptomatic fistulae to exclude development of symptoms or arrhythmias, progression of fistula size, or cardiac chamber enlargement. Rose M, Clarkson W. At the Viewbox: Coronary-Pulmonary Artery Fistula. J Am Osteopath Coll Radiol. 2013;2(2):29. Michael Rose, D.O., Wesley Clarkson, D.O. Dr. Rose and Dr. Clarkson work with the Department of Cardiology, San Antonio Military Medical Center, San Antonio, TX.